What kinds of rooms do you have? There are 5 types of room at the hotel. 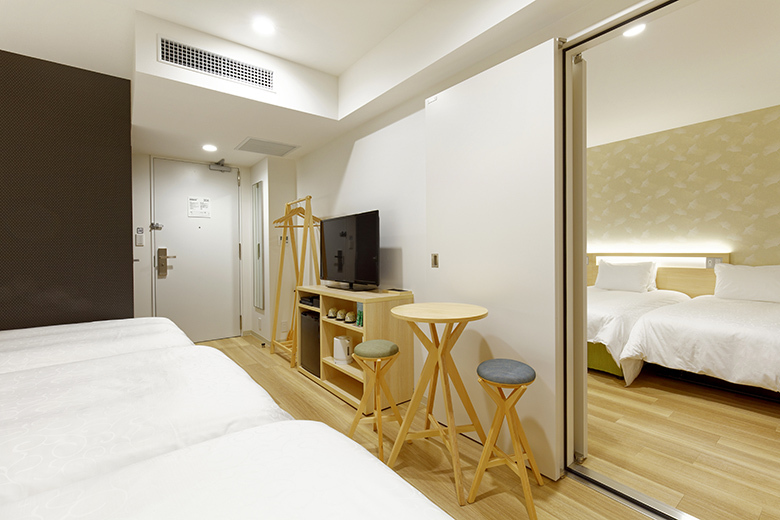 In addition to 31 twin rooms and 80 twin rooms with extra beds, we have one semi double room. 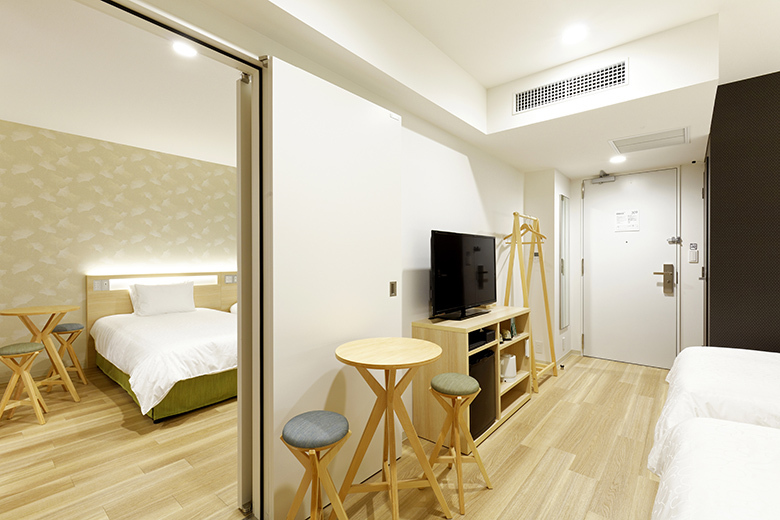 Aside from the semi double room, all rooms have a functional layout featuring separate showers, sinks and toilets. For details on our guest rooms, please click here. We also have 64 connecting rooms that are popular with families and groups. Smoking is not permitted in any of the guest rooms. However, smoking areas are available on the first floor. Sorry, we do not have a child rate. Children aged seven and above are charged at the same rate as adults. Children aged six and under are also charged the same rate as adults if they require a separate bed. Do you have pajamas for children? Our guests are kindly requested to bring pajamas for their children as none are available at the hotel. We are sorry, but we are a pet-free hotel. Can service dogs stay at the hotel? Yes. If you plan to bring a service dog, please inform the hotel in advance at the time of booking. Yes. The entire hotel is wheelchair accessible. Do all rooms have a minibar and fridge? The rooms do not have a minibar, but they do have a fridge. Please note that the fridges do not contain drinks or other items. What amenities are available in the rooms? For a list of the room facilities and amenities available, please click here. Are outside visitors allowed to use the restaurant? We are sorry, but only staying guests of karaksa hotels can enjoy the restaurant. Is the restaurant available for other than breakfast? The restaurant space is available, however no food or drink is served outside of breakfast hours. A buffet-style breakfast is available from 7:00 a.m. to 10:00 a.m. in the restaurant on the first floor. Please be seated by 9:30 a.m.
Can luggage be left at the hotel before check-in or after check-out? Yes, you can leave your luggage at the front desk on the first floor. Is it possible to send luggage to the hotel before arrival? *Please do not include cash, valuables or raw food items in the luggage. Your luggage will be handed to you when you check in. If you would like to have your luggage taken directly to your room, please request so to the front desk before your arrival. Yes, this service is available at the front desk. Packing materials are available. Are there any shops in the hotel? There are no shops, but there are various types of vending machines on the fifth and ninth floors. Is there a space for storing valuables? Please place cash, jewelry and other valuables in the security deposit boxes in the first floor lobby. Do you have vending machines and ice dispensers? There are vending machines on the fifth and ninth floors. There are no ice dispensers, but ice is available at the front desk. Yes, please use the smoking areas on the first floor. All other areas of the hotel are non-smoking. There is no laundry service, but there is a laundromat on the second floor. The front desk can also advise you about nearby laundries. Yes, they are on the second floor. We are sorry, but we do not. Are we allowed to go to the communal area in the slippers provided in the room? There is no massage room, but the front desk can arrange a massage for you, so please feel free to ask us. Is internet available throughout the hotel? Yes, a free Wi-Fi connection is available throughout the hotel. Can we open the windows in the rooms? We are sorry, but the windows do not open for safety reasons. Please note that the air vent in the bathroom provides ventilation 24 hours a day. Is it possible to exchange currency at the hotel? It is not possible at the hotel, however the front desk can provide details of nearby banks that offer currency exchange services. How do I get to the hotel from Kansai International Airport / Osaka International Airport (Itami Airport)? Please click here for information about how to get to the hotel from the airports. A convenience store is within one minute’s walk. Also, the Dotonbori Shopping Arcade and Shinsaibashi Shopping Mall are both about five minutes away. For details, please ask at the front desk. What tourist attractions are there near the hotel? Please click here for information about tourist attractions near the hotel. A Seven Bank ATM is available in the convenience store five minutes’ walk away. The convenience store and post office have ATMs that accept foreign cards. For details, please ask at the front desk. Is there a hospital near the hotel? 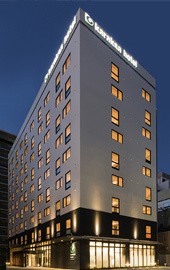 Osaka Red Cross Hospital (General and Emergency) is located 15 minutes’ drive from the hotel. There is no curfew, however the hotel entrance is locked from 01:00 a.m. to 05:00 a.m. for security reasons. 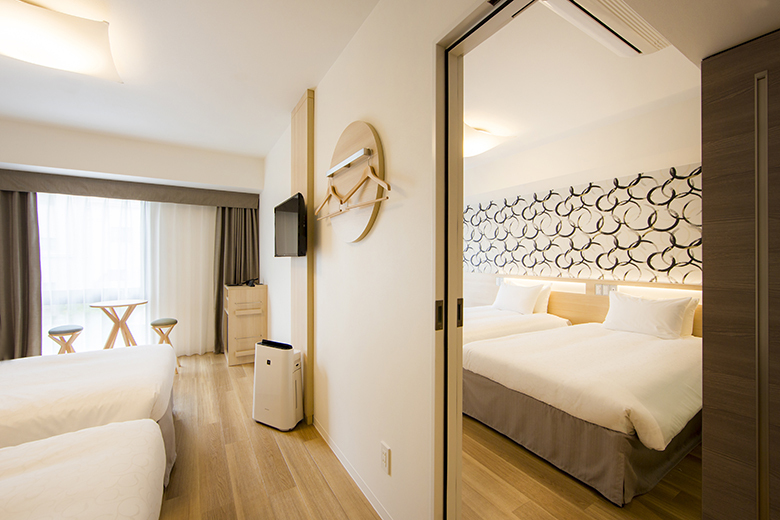 The entrance can be opened using your room key. Alternatively, use the intercom to speak with the hotel staff. Please ask at the front desk. We will be happy to recommend you a car rental company. We accept VISA, MasterCard, JCB, AMEX, Diners Club, UC, DC, NICOS, UFJ and UnionPay. We keep lost property for up to three months. Food in an open packet will be disposed of on the day it is found, while food in a sealed packet will be kept for three days before it is disposed of. Valuables will be kept at the hotel for five days, then reported to the nearest police station. *In the interests of the privacy of our guests, the hotel will not contact the owners of lost property, with the exception of certain valuable items.